The picture shows a view of Rhododendron kotschyi (= R. myrtifolium) in the Carpathian mountains of Transylvania, probably Bucegi Natural Park. 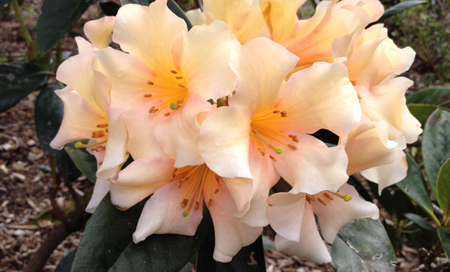 This, and two other species R. hirsutum and R. luteum, were the subject of a fascinating investigation involving a potentially new player in the game of how Rhododendron’s, and other plants, get their nutrients. You may remember in the October 2015 newsletter Alex Pottage wrote on mycorrhizae, the symbiotic fungi essential to plant nutrition. In that article a mention was made of a mycorrhiza that lures and kills small soil insects, to get nitrogen, which it then passes on to pine trees. It seems a range of other animals/mycorrhizae/plant interactions remains to be uncovered. To read more of this and other interesting articles see the newsletter.